People of all ages enjoy skiing, but in order to go skiing you need the right gear. The question is, "should you buy or rent skis? 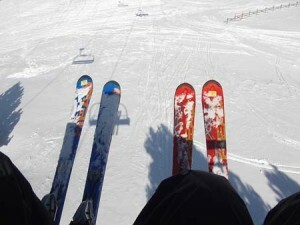 Cost - Depending on whether you rent basic skis or demo skis, the cost of renting skis can range from $25 to $50+ per day. This can add up quickly. See if you can find any shops offer screaming deals on season long rentals. Latest Gear - When you rent skis, you'll be able to test out this season's latest gear. It's easy to switch out your skis on a daily or even hourly basis to match the snow conditions. You basically have a huge quiver of skis to choose from. 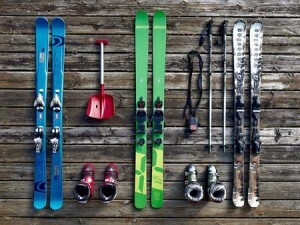 Maintenance - There are no maintenance costs associated with renting skis. The shop takes care of everything. But you should always get the extra insurance - especially when skiing in Big Sky. Performance - When you rent skis, you may never reach your peak because you'll always be adjusting your techniques to new gear. Travel - The best part of renting is that you don't have to travel with awkward ski gear and you won't have to pay extra airlines baggage fees. With online reservation for most ski rentals or even home delivery, renting can be pretty easy. Cost - Skis, bindings, boots, and poles can easily cost over $1000. There are often great deals online or check out some of the end of seasons sales at some of Big Sky's retailers. Latest Gear - When you buy skis you'll be stuck with your gear for at least a season or two. It's a good idea to demo skis and use a trusted shop to help you pick the best gear for you in all snow conditions. Most skis will last about 100+ days before they need to be replaced. Maintenance - You are responsible for your own skis. If you get a core shot, blow out an edge, or need wax it's on you. Ski maintenance isn't too expensive, but it can add up if you're rough on your gear. Performance - Owning your own gear will boost your performance, confidence, and comfort. You'll always know what to expect because you know how your gear performs at all times. There are no surprises and this will make you a better skier. Travel - Traveling with ski gear is a hassle. Airlines charge you more, you have to have a vehicle big enough to transport your gear, and ski bags are awkward. How much do you really ski? If you ski enough days in a season, it makes sense to buy skis. It's a smart investment. Will out grow your gear? You will need different gear if you (or your child) grows or if you go from beginner to expert levels. What type of skier are you? Do you plan to ski groomers, make tram laps, session the trees, ski powder, or all of the above? One popular alternative is to buy ski boots only. Ski boots are your direct connection to the ski and therefore directly impact your performance on the mountain. 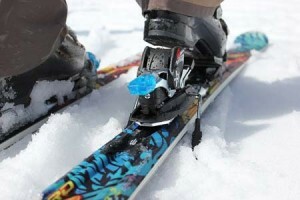 Boots aren't as expensive as buying an entire ski set up, they work with rental skis, and they are easy to travel with. Will you buy or rent skis? Whatever you choose to do, we look forward to seeing you on the slopes of Big Sky soon!